“The improved Travel Crib Light has airy mesh that extends all the way to the floor, a new feature which will allow parents and baby to see one another for a feeling of added security. In addition, newly added loops make the mattress even easier to attach to the frame. Travel Crib Light has retained the features that made earlier generations so appealing to parents, including its lightweight frame that sets up in one swift movement. When not in use, Travel Crib Light can be quickly folded up and stored away in its travel case. The crib’s soft mattress sits firmly on the floor, providing a safe place for baby to sleep or play.” You can discover more about this great product in Miss Frugal Mommy's review! Now for the exciting part! 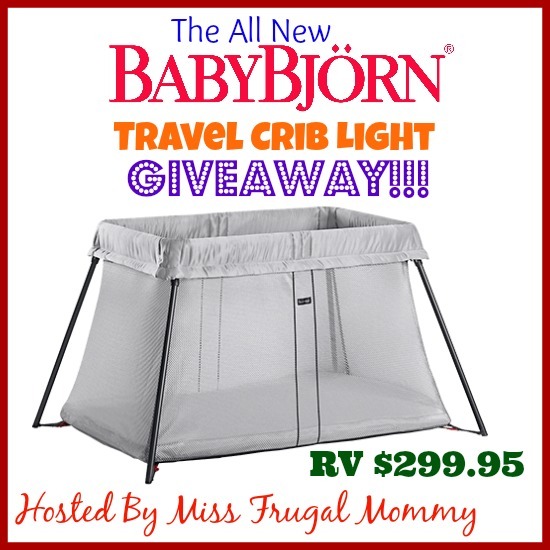 One lucky fan is going to win a BABYBJÖRN Travel Crib Light (RV $299.95) This giveaway is open to US residents 18 and older. Enter to win in the giveaway tools below, all entries will be verified, one entrant per household or you will immediately be disqualified. Winner will be contacted via email and has 48 hours to respond before a new winner is chosen. Prize fulfillment is the responsibility of the sponsor and not the participating bloggers. Good Luck!!! I love the Bouncer Balance Soft.